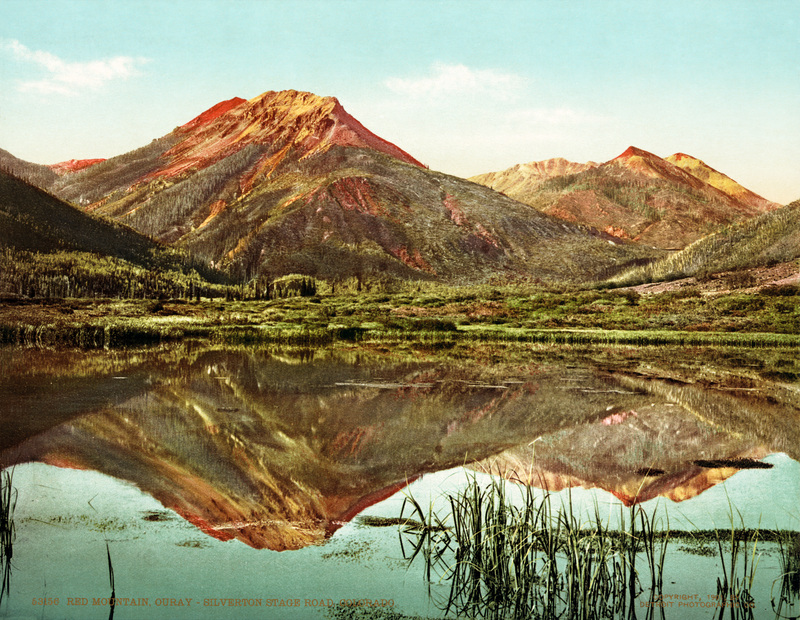 1901 photochrom print of the Ouray–Silverton stage road, now part of U.S. Highway 550 and the San Juan Skyway. Durango is nestled in the foothills of the San Juan Mountains and is a great starting point for the San Juan Skyway Scenic and Historic Byway motorcycle ride. Because it’s a loop, riders can set out from Durango and head west on Highway 160 to Cortez or north on Highway 550 to Silverton. The route takes riders over several mountain passes, each at altitudes of 11,000 feet or higher, and through historic mountain towns that have been frozen in time. You’ll find plenty of turn-of-the-century mining history in Silverton and Telluride as well as signs of ancient pueblo civilizations in both Mancos and Cortez. The route includes a stretch of road between Ouray and Silverston that’s known as the “Million Dollar Highway.” Riders will also pass through the towns of Placerville and Ridgway and will pass by some of Colorado’s most impressive peaks, including Mount Wilson and Mount Sneffels. If you start in Whitewater and head south to Placerville, this byway could serve as the first leg of your route to Durango — or on your way out. (Placerville is about 115 miles north of Durango). The Unaweep Tabeguache Scenic and Historic Byway includes Highways 141 and 145 and takes riders through the red sandstone of the Unaweep Canyon, following the paths of both the San Miguel and Dolores rivers (the same rivers that carved out the canyon). Keep your eyes peeled for bighorn sheep on rocky ledges near Whitewater, visit the historic Driggs Mansion or stop at the ruins of Hanging Flume, a mining town-era aqueduct system just outside of Naturita. This route is a little out of the way — Alamosa is about 150 miles east of Durango — but you’re here to ride, right? The Los Caminos Antiguos byway dishes up a wealth of historic sites and ancient ruins, including Colorado’s oldest Catholic parish in Conejos, the state’s oldest existing community, San Luis, and Colorado’s oldest military post, Fort Garland. Near the fort, riders will find Great Sand Dunes National Park and Preserve, which boasts the highest sand dunes in the nation and is reason enough to make the journey. That’s just a few of the area’s amazing motorcycle rides. Heck, Southwest Colorado boasts nothing but scenic routes for riders to enjoy. While you’re here for the Four Corners Motorcycle Rally, maybe tack on a couple extra days to squeeze in some more amazing ride time and be sure to stay with us at the Durango Quality Inn!